The I-Tal Hemp Wick is an all-natural solution offering a clean burning flame designed to remove the chemical dangers of using butane lighters. Made with organic hemp saturated in organic beeswax, the I-Tal Hemp Wick provides more flavor by removing the nasty taste of metal or butane. 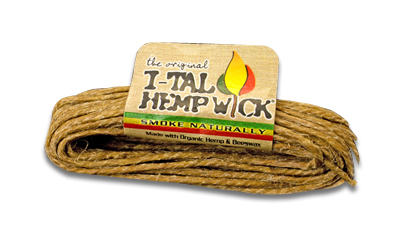 The I-Tal Hemp Wick is an ideal flame source for use with the VaporGenie and other flame-driven portable vaporizers. Quit using nasty butane lighters that won’t stay lit and grab some Hemp Wick today! Here are the benefits of using our Hemp Wick lighters instead of traditional lighters. Is healthier for the earth and for you. Is made from 100% all natural hemp and 100% organic beeswax... and is 100% biodegradable. Eliminates foul tasting and unhealthy lighter fumes, like those produced by traditional lighters. Provides a clean burning flame (no chemical tastes) for the smoking connoisseur. Allows you to totally enjoy the full flavors of your favorite smoking blends. Will inherently prolong the life of your other lighters, which reduces the amount of lighters being sent to landfills each year. Can be used as a candle for repeated lighting of objects. Is a must for all smoking connoisseurs and enthusiasts.